It's time to celebrate Chanukah in Israel! Grover's bringing the latkes and all is well until Anneliese gets caught in a game of tag with a chicken and loses her special menorah, just as Chanukah is about to begin! 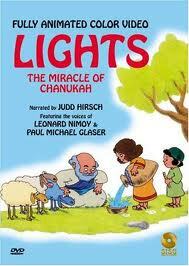 Can her friends find the missing menorah in time? Guest appearance by Debi Mazar. This animated film introduces children to the story of Hanukkah and the many traditions surrounding this important holiday. In one way, this film is the story of a people struggling to preserve their identity in the face of a cruel world. In another, this film addresses the larger issue of the right to be different. Leonard Nimoy and Judd Hirsch are two of the voices children will hear.